We are sharing today 3 beautiful textured paper logo mockup psd set. 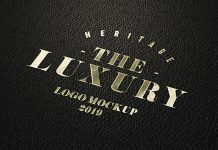 Place your logo design, logomark or typography on smart object and get a super realistic outcome. You can customize from gold to silver preview in 1st logo mockup inside zip archive. Hide the golden layer and unhide silver layer to get silver embossed effect on paper. Some examples are given below for your reference.